September 12, 2014, 6:00 a.m. Shortly before he stepped down as Prime Minister, Tony Blair warned David Cameron to beware Gordon Brown’s “great clunking fist”. Cameron survived it, but Alex Salmond’s bid for Scottish independence may not. Since Brown entered the debate, the Yes bandwagon, which had been rolling so dramatically, has stalled. 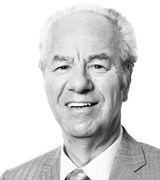 His warnings that independence would be bad for jobs and family finances have struck home. 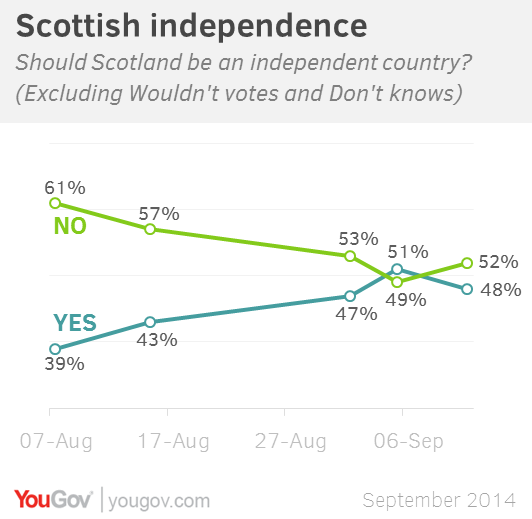 YouGov’s latest survey has No, on 52%, narrowly ahead of Yes, 48%, after excluding don’t knows. This is the first time No has gained ground since early August. Three previous polls over the past month had recorded successive four point increases in backing for independence. In early August Yes support stood at 39%; by last weekend it had climbed to 51%. Responses to two questions tell us why Yes has now slipped back, albeit only slightly: it remains at a much higher level than at any point up to late August. We regularly ask people how they think independence would affect Scotland’s economy and their families’ own finances. During the Yes surge, optimism rose sharply and pessimism declined. 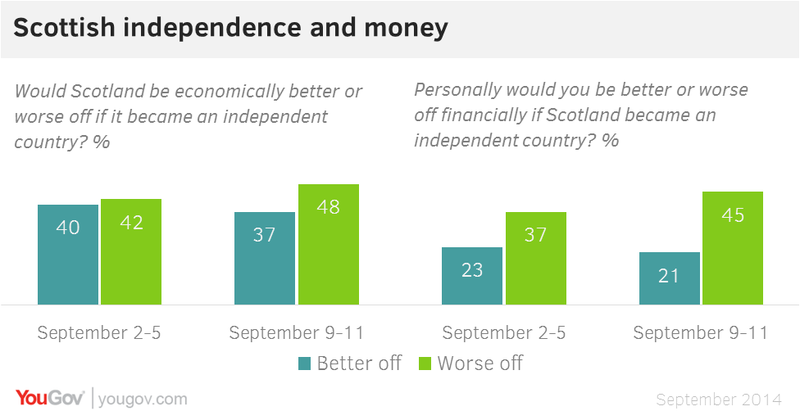 Just one week ago, Scots divided evenly on whether their country would be better or worse off. Now, the pessimists, 48% (up six since last week), clearly outnumber the optimists, 37% (down three). And the proportion who think that they personally would be worse off under independence is up as much as eight points in a week, to 45% - the highest in a series that goes back to last December. A key reason for the renewed fears of independence is what might happen to people’s bank accounts. The biggest single advantage of the union cited by No voters is that the UK would have the resources to step in if Scotland faced another crisis of the kind that erupted in 2008. Men now divide 54-46% in favour of independence, little changed on 55-45% a week ago, while the proportion of women now planning to vote Yes has dropped from 47% to 42%, with 58%, up from 53%, now intending to vote No. All polls, of course, are subject to a margin of error. So it might appear significant that the three polls published in the past three days have produced very similar figures, with Survation reporting No ahead by 53%-47% and TNS putting the two sides exactly level. Yet these similarities conceal something odd. Like YouGov, TNS detected the big Yes surge, with their latest survey showing Yes support up eight points since early August. Survation’s poll yesterday, like that from Panelbase last weekend (whose headline figures are identical to ours) detect no such surge. They have been reporting narrow Yes leads all year. According to them, nothing has changed in the past few weeks. I believe they are wrong, not just because our headline trends are different but because, once again, we are able to compare the views of the same people through time. More than 600 respondents in our latest survey were previously questioned at some point between January and July, when No held a steady lead approaching 60-40%. Since then, the Yes camp has lost eight supporters – and gained 62 from No and don’t know. In contrast, the No camp has lost 35 and gained 23. The net “swing” from No to Yes is 7% - in line with our headline results. I cannot explain why Survation and Panelbase tell a “no change” story. They are newcomers which have yet to establish a record for accuracy. TNS, whose assessment of the Yes surge is much the same as ours, is a highly respected company with a long history of polling in Scotland. Sometimes, perhaps, experience does help. Meanwhile, we cannot tell whether the No recovery will continue – or prove a brief setback to be followed by a renewed surge in Yes support. But if Salmond is to get his campaign back on track, he must, once more, reassure his fellow Scots that independence will not threaten their jobs and living standards. He has lost this week’s skirmishes; the next seven days will tell us whether he has lost the war.